China is using debt to control the South China Sea. China’s One Belt One Road project and the massive infrastructure loans associated with it are helping to weaken opposition to its claims in the South China Sea. Japan announces the name of the era under the new emperor. Naruhito will become the Japanese emperor on May 1, beginning the “Reiwa” era. Alexandria Ocasio-Cortez is a fan of MMT — here’s what it is. Modern Monetary Theory says governments who create their own money can spend freely because they can always print more money to pay off their debts. Find out why people are so interested in it. There’s a more ominous recession threat than the yield curve. “Being the simple, unsophisticated soul that I am, all I believe the inversion of the yield curve tells us is that the Fed has raised interest rates considerably,” Societe Generale strategist Albert Edwards said in a note. Lyft goes public after being wildly unprofitable last year. The ride-hailing app lost $911 million last year — see how other unprofitable companies fared after they went public. Stock markets around the world were higher. China’s Shanghai Composite (+2.58%) led the gains in Asia and Germany’s DAX (+1.22%) was out front in Europe. The S&P 500 was set to open up 0.67% near 2,854. Earnings reporting is light. Cal-Maine reports ahead of the opening bell. US economic data keeps coming. Retail sales will be released at 8:30 a.m. ET before Markit US Manufacturing PMI and ISM manufacturing cross the wires at 9:45 a.m. ET and 10 a.m. ET respectively. The US 10-year yield was up 3.5 basis points at 2.44%. The storm is here. The Kingdom is barren as snow begins to fall on the once thriving settlement. The fair is over, but the promised trade didn’t bring what many hoped. Their pipes still burst, the rot still spread, and this home, this beacon for so many who sought shelter from the cold apocalyptic wasteland, became untenable. So now, the King and Queen, still carrying the grief of losing their son, must now carry their people to Hilltop as a harsh blizzard descends upon them and the Whisperers still lurk in their periphery. But, once the storm passes and their friends on the hill open up their gates, it all seems like a blip on the timeline. We’re left with both hope and a promise of much bigger things to come. It’s a moment loosely lifted from the comics in which Eugene is the one on the line instead of Ezekiel. Rosita and Gabriel have also dealt with their love triangle situation with Siddiq as they worked on setting up the radio channels as another deviation from the source material. But, the voice on the other line sounds female which alludes to the comics, which sees Eugene making contact with a woman named Stephanie. Stephanie, for those who don’t mind delving into potential spoilers from the page, is a member of the Commonwealth, part of a vast network of communities based in Ohio for which the producers of The Walking Dead have already been laying the groundwork. (The name was etched into one of the wooden signs at the bridge construction site.) As a refresher, the Commonwealth is an advanced civilization comprised of approximately 50,000 survivors. They retain advanced equipment and weaponry, as well as a class system that yields things like cafes, tailors, butchers, and… record players? A prevalent theory is that Georgie, the music-loving stranger who arrived at Hilltop’s doorstep, is a member of the Commonwealth. That would mean the radio connection could lead to a reunion with Maggie, who stepped down as leader of Hilltop to live with Georgie. Per current events on the AMC series, Michonne, Gabriel, and the others still haven’t had any contact from their friend. We also still don’t know what happened to Rick after Anne left with him in a helicopter to go off and star in some Walking Dead movies. When Eugene was first seen working on the radio, some theorized this could lead to a reconnection with Rick on the show. Per usual, the one thing we do know is that the world of The Walking Dead continues to expand. The radio, which can bring more people into the fold, ties in with the episode’s theme of connectivity. As Michonne says earlier to Ezekiel at The Sanctuary, where the group redirects after the storm becomes too volatile, Alpha was able to walk amongst them at the fair because they didn’t know each other. She refuses to let that happen again, but it’s not without a transition period. Lydia still feels like an outcast. People project onto her after Alpha’s beheadings. Alden’s rage over the death of Enid flares on the road to Hilltop and Carol can’t help but see her son when she looks at Lydia. Carol finds Lydia off in the woods alone about to take her own life by feeding herself to a frozen walker. The cold only exacerbates the tension as they are all forced to remain close together to stay warm, causing further friction between Daryl and Ezekiel as the King wants the arrow-slinger gone so he and Carol can focus on their relationship. The same goes for the Alexandrians. They are forced to bring Negan out of the jail cell so he doesn’t freeze to death, placing him in close corners with Gabriel, Rosita, Eugene, Saddiq, and Judith. When their fireplace threatens to burn them all alive, due to the toxic buildup that’s been allowed to fester in the chimney, they move to the next home with a working hearth, trudging blindly through the white-out in a single file line, everyone clutching a single piece of rope. Judith, however, has lost track of Dog. When she hears a bark in the distance, she lets go of the rope and heads into the storm. Negan follows suit. Though injured by the debris swirling about, he finds both Judith and Dog and leads them back to the warmth of Aaron’s house. Michonne and Ezekiel’s group face their own complications. The Sanctuary doesn’t have many supplies and if they don’t move the Kingdom’s people to the next way station, they will all die. With Rick’s bridge still demolished, their only course is to cut through Alpha’s territory and walk across the frozen river. They find themselves on metaphorical thin ice: if a single Whisperer spots them and informs the leader, they risk war with Alpha and larger casualties. What they find instead is walkers, some flash frozen by the subzero temperature. What the group doesn’t acknowledge, however, is their footprint. Before crossing over Alpha’s border, an aerial shot highlights the footprints in the snow left behind by a herd of walkers. Later, as Michonne cuts her way through the dead, she leaves footprints in the snow, as well as decapitated walkers in her wake, both of which could easily tip off Alpha. When they reach the river, they leave a bloody scene as walkers rise out of the snow. They are harder to kill as the ice forming on their decaying flesh forms an armored layer, but they too fall as the group makes their way across the frozen water. Aaron warns if they move too fast or if too many cross the water at the same time, they risk falling through the ice. But they don’t. Everyone makes it through Alpha’s territory with zero casualties, Carol makes peace with Lydia, and the group reaches Hilltop. But things are different now. Taking Ezekiel’s ring off her finger, Carol decides to go with Michonne, Daryl, Aaron, and Lydia back to Alexandria and there’s a glimpse of what their lives could look like. Judith and RJ get into a snowball fight with the group, and Michonne goes to thank Negan for saving her daughter from the cold. They survived the cold by sticking together, and their best chance of surviving the Whisperers is to do the same. Alpha, who remains absent for most of the hour, reemerges once the cold winds have died down. “I’ll need to be stronger for what comes next,” she says. And she’ll do that the same way she tried for her daughter. She peels the leaves from a vine and hands it to Beta, who whips it repeatedly across her arms, leaving behind the same lash marks Daryl once found on Lydia. As the strikes continue, Alpha may wince, she may strain, but she remains quiet, pensive, determined. AMC’s zombie thriller, based on the classic comic book serial created by Robert Kirkman. Liverpool manager Jurgen Klopp says his team needed “luck” to beat Tottenham, but added that “desire and attitude” is driving their Premier League title bid. Toby Alderweireld’s late own goal at Anfield on Sunday moved the Reds two points clear of rivals Manchester City, who have a game in hand. Liverpool are attempting to win their first top-flight title for 29 years. “We compete with Manchester City. Tell me two better teams at the moment – and we compete with them,” Klopp said. “I told the boys after the game there are 500,000 ways to win a football game, and today was rather ugly. “But without a bit of luck you cannot be in the position we are in. Defending champions City will regain top spot if they defeat strugglers Cardiff at Etihad Stadium on Wednesday (19:45 BST kick-off). Pep Guardiola’s side became the first team in English top-flight history to reach 100 points when they won the league last season. However, Klopp’s side are also breaking new ground and their tally of 79 points from 32 fixtures eclipses the 76 they had in 1987-88, when they went on to win their 17th of 18 top-flight titles. “If we are top of the table after the last matchday, it would be a championship of will,” said Klopp, who pinpointed the reaction of the Anfield crowd to Lucas Moura’s equalising goal with 20 minutes left on Sunday as being crucial to his team. “Nine months ago, we started and wanted to go for the highest stakes in two competitions. We did it our way. For all the points we have now, we work really hard. “It is not important when you score but what it is on the scoresheet afterwards. Momentum is not a coincidence – it is something you take, you keep and you use. TOKYO (AP) — The name of the era of Japan’s soon-to-be-emperor Naruhito will be “Reiwa,” the government announced Monday. Emperor Akihito is stepping down on April 30, in the first abdication in 200 years, bringing his era of “Heisei” to an end. The new era takes effect May 1. 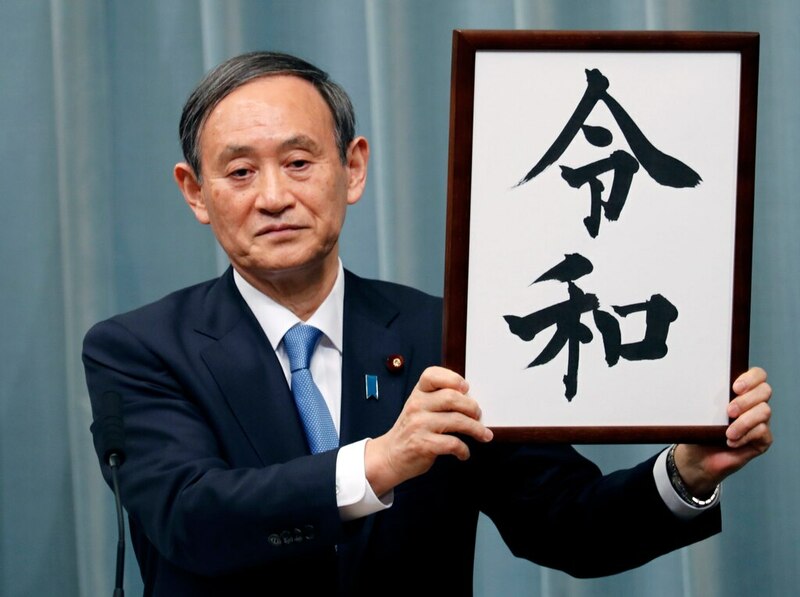 The name draws from the 7th century poetry collection “Manyoshu,” Prime Minister Shinzo Abe said after the announcement by the chief cabinet secretary, Yoshihide Suga. “With this selection of a new era name, I renew my commitment to pioneer a new era that will be filled with hope,” Abe said. The Manyoshu is Japan’s oldest poetry collection and symbolizes Japan’s rich culture and long tradition, he said. The choice was a break from more than 1,300 years of drawing era names, or “gengo” from using Chinese classics. It was kept strictly secret ahead of Monday’s announcement. “We hope (the era name) will be widely accepted by the people and deeply rooted as part of their daily lives,” Suga told reporters in first announcing the name, written in two Chinese characters in black ink calligraphy on a white background. The announcement allows only a month ahead of the switch for government, businesses and other sectors to adjust to the change that still affects many parts of Japan’s society, even though the system is not compulsory and the emperor has no political power under Japan’s postwar constitution. Under the 1979 era name law, Abe appointed a panel of experts on classical Chinese and Japanese literature to nominate two to five names for top officials to choose from. The names had to meet strict criteria, being easy to read and write but not commonly or previously used for an era name. Japanese media scrambled to get scoops out of a new era name. Rumors included “Ankyu,” which uses the same Chinese character as in Abe’s family name. There had been speculation that Abe’s ultra-conservative government, often hawkish on China matters, would choose the name from a Japanese document, breaking with the tradition of using Chinese classics as references. The name selection procedure started in mid-March when Suga asked a handful of unidentified scholars to nominate two to five era names each. Several nominations were presented at a first, closed-door meeting that included nine outside experts from various areas, including Nobel prize-winning stem-cell scientist Shinya Yamanaka and award-winning novelist Mariko Hayashi, to present their views and narrow the selection before final approval by the Cabinet. While a growing number of Japanese prefer the Western calendar over the Japanese system in a highly digitalized and globalized society, the era name is still widely used in government and business documents. Elders often use it to identify their generations. Discussing and guessing new era names in advance is not considered a taboo this time because Akihito is abdicating. Era name change is also a time for many Japanese to reflect on the outgoing and incoming decades. Akihito’s era of “Heisei,” which means “achieving peace,” was the first without a war in Japan’s modern history, but is also remembered as lost years of economic deflation and natural disasters. Heisei was the first era name decided by the government under the postwar constitution, in which the emperor was stripped of political power and had no say over the choice. Still, the government, with its highly secretive and sensitive handling of the process, is underscoring that “the emperor has power in an invisible, subtle way,” says Hirohito Suzuki, a Toyo University sociologist. Era name changes are creating businesses for both the outgoing and the incoming. Anything dubbed “last of Heisei” attracts Akihito fans, while others are waiting to submit marriage certificates or filing other official registration until the new era starts. Analysts say the era change that expands the “golden week” holidays to 10 days on May 1 could buoy tourism and other recreational spending. Cecile Eledge gave up coffee for nine months. She did everything doctor’s told her. Eledge, 61, said she was joking when she offered to be the gestational surrogate her son and his husband needed. To her surprise, she passed a battery of tests including heart, cholesterol and stress. A week ago, Uma Louise was born at Nebraska Medical Center weighing 5 pounds, 13 ounces. Married dads Matthew Eledge and Elliot Dougherty said the birth of their daughter was possible thanks to the women in their life, Eledge’s mother and Dougherty’s sister. Eledge’s mother carried and delivered their baby. Dougherty’s sister donated eggs to conceive. “We have some selfless women in our lives,” Matthew Eledge, 32, a teacher, told USA TODAY. His mother said through all the testing, she kept expecting doctors to say she wasn’t fit to be a surrogate. Eledge said she was more careful than she ever was with Matthew, whom she never fully gave up coffee for. Baby Uma was conceived through in vitro fertilization, using Eledge’s sperm and eggs from Dougherty’s sister, Lea Yribe. Dougherty’s sister made the couple who “felt vulnerable” think having a child was even possible, Elliot Dougherty said. He begin talking to her a couple a years ago and his now 26-year-old sister offered to donate some of her eggs. Matthew Eledge said with their salaries as a school teacher and hair dresser, it would have been so much more difficult to have a child and pay someone to serve as surrogate and egg donor. But it also seemed cold and corporate. Editor’s note: Business Insider surveyed 1,884 young Americans about their buying attitudes and beliefs. This is part of a series of stories that will be rolled out over the next several weeks. Participants in the survey were all Americans between the age of 13 and 21. The national poll was conducted with SurveyMonkey Audience partner Cint on behalf of Business Insider. It ran from January 11 through January 14. Out of those participants, 1,559 young people answered the question about the biggest issue facing the country, while 325 opted to skip it. All in all, a total of 295 young people indicated that Trump was the biggest problem facing the nation. That’s just over 18% of the individuals who answered the write-in question, but it was by far the most popular response. Even the second and third most popular answers were closely connected to the president’s actions. The runner-up response was “the government shutdown,” which proved to be the most important issue for 183 respondents. And issues surrounding Trump’s proposed border wall were significant for 123 young people. What’s more, many of the participants were scathing in their comments about Trump. “Trump thinks he can do whatever he wants and doesn’t care about who he hurts,” one young person wrote in their response. But the responses included a few pro-Trump outliers. Out of the 295 responses mentioning Trump or “the president” more generally, two appeared to take more of an issue with Trump’s detractors. One participant wrote that “people not supporting the president” was the biggest issue in the US today, while another agreed that the fact that “people don’t like our president” was a significant problem. The results of the survey aren’t exactly surprising, considering Trump’s relative unpopularity with young people. In January 2019, the Pew Research Center found that only 30% of Generation Z approves of the president’s performance, significantly lower than his overall approval rating. Of course, Trump does have some support among younger generations, as evidenced by the thousands of young attendees at the pro-Trump Turning Point USA’s Student Action Summit this year. But, on whole, the numbers might give pause to politicians of the Trumpian strain as Generation Z continues to reach the voting age. Correction: An earlier version of this article said that 5% of respondents listed Trump as the biggest issue facing the US. SPOILER ALERT: Read on only if you have already watched Sunday’s season 9 finale of The Walking Dead. There’s no business like snow business, and that’s the business The Walking Dead was in for its season 9 finale as it showed two different groups of survivors — one at Alexandria, and another making its way from the Kingdom to the Hilltop — trying to brave blizzard conditions to get to safety. The epic storm was an epic undertaking for the crew to recreate a winter wonderland while filming in decidedly non-snowy Georgia. ENTERTAINMENT WEEKLY: I’ve been begging you guys for years to give us winter on the show, but you all just blew past what I ever expected. I was just looking for some light flurries or something. Instead, we got a massive blizzard. Just start off by telling me how you wanted to approach this as a director knowing how difficult is going to be to pull off? GREG NICOTERO: As you said, we’ve never done anything like this. I’ve been dying for frozen zombies too. Some of the greatest moments in the comic books involve frozen zombies. And it’s something we’ve been talking about and wanting to do for a long time. So we started prepping, and following up on episode 15 is a big deal. That episode in itself felt like a finale, because of just the emotion and everything that happened. So the idea of really setting the stage for the future of the show and giving the audience something they had never seen before is what led us into this frozen tundra. And this wasn’t just a first for the show. The was a first for you as a director, right? When [showrunner Angela Kang] had initially called and said, “Hey, we’re going to do snow.” I’m like, “Ah, this is going to be great! I’ve never shot in fake snow before. I’ve never done anything like this.” And it wasn’t just snow, there’s a blizzard. And the snow has to be thick enough that if you see figures shrouded in snow, you’re not supposed to be able to tell whether they’re walkers or Whisperers. Because that’s the whole plot of that part of the episode, which is: They don’t know if they’re being followed. They assume they’re being followed. So I treated the snow as if it was a guest star on the show, like it was one of the leads. We ended up hiring a company called Snow Business, and they came in and we mapped out probably in about two-and-a-half weeks everything we wanted to do in terms of which scenes were going to take place on stage, which scenes were going to be outside, and how we were going to do the snow. The trick is, you’ve got to know exactly where your camera is going to be, you got to know exactly where you can pan left or right, because if you pan too far left, you run out of snow. And then I went to Jeff Schoen, the production designer, and we pitched the idea of building the frozen riverbed on stage. So, we actually built that at Pinewood Studios in Georgia, where they shot Guardians of the Galaxy and all the Marvel movies. And we built that entire stage indoors, so that we could control the smoke, we could control the wind, we could control the snow, and the temperature. And it was probably the biggest undertaking that The Walking Dead has ever done in terms of a production design scenario. There were so many different hurdles you guys had to clear to make this happen. What was the hardest thing to pull off? There was a lot of story to tell, because we had a lot of stuff going on with a lot of different people, and charting their journey from the Kingdom all the way to Hilltop. There were lot of pieces, and we wanted to make it fresh, and we wanted it to feel original. When the zombies come out of the snow, around the riverbank, that was sort of my homage to the classic horror zombie moment, where zombies are coming out of the grave in the cemetery — like Thriller, and Children Shouldn’t Play With Dead Things, all these crazy cool movies and shows where the zombies come out of their grave. That’s such a great classic, provocative horror moment. So, when we got to this sequence, we had the idea of: What if there’re zombies buried in the snow? So when Daryl gets up to the edge of the river, and there are all these lumps that you presume are rocks covered with snow. And then we ended up doing it so that the rocks start to move and then all of a sudden they realize that it’s a minefield of zombies. The challenge of our show is these guys are so efficient and so good at killing walkers that they’ll have to be surprised. Otherwise, they look stupid. And I’d even talked to Matt Negrete, the writer, and I said, “There’s a scene in Kelly’s Heroes, an old war movie, where Clint Eastwood, and Telly Savalas, and these guys walk into a landmine, and then the landmine goes off and they’re all trapped, and they can’t move, because they don’t know where to walk.” So, that was the vibe I was going for, and that, of course, they have to kill the zombies as they’re coming out of the ground. They also have 60 people with them. They’ve got to get those people across the river safely and protect themselves, all at the same time. So, there was a lot going on in that particular sequence, which we shot literally over a day and half. How did you create those frozen walkers like the one Daryl smashes with his crossbow at the Hilltop? We always talk a lot about, what happens to the blood? And if these things are frozen solid, I really love the idea that when he hits it, there’s no blood. Everything is crystallized. So we did a test at the shop and made purple, pink, light blue, and white crystals of silicone and resin and we loaded the head. So that when he hit it, all that stuff would fly into the air, like if you took a handful of snow and threw it into the air. So, it kind of all falls at different rates and then it glistens. I really wanted that moment. It’s also a great little F.U. for the end of the episode, where they made it through the entire frozen tundra, and they’ve made it back to Hilltop and Daryl walks up and there’s one that’s frozen solid right in front of him and he smashes it. And then there’s the zombie that’s frozen into the water, that Lydia encounters. We shot that in the exact same location where the camp was in episode 5 that gets over run by the zombies when they’re chasing Rick — that camp for where they’re rebuilding the bridge. We shot it in the same spot, and we needed a little bit of a slope, so that we could build a platform that went off about 12 feet and we created a little frozen edge. And it looked like an infinity pool, so when you were shooting at the walker’s face, when it was frozen, we had a little platform, we covered it with black plastic. And then poured paraffin wax on it, to make it look like frozen ice. When you filmed on it, we had the edge of the platform disappear, and then we put snow on the ground behind it. So it looked like an infinity pool. So, looking at that, and just thinking that if you literally just turned the camera to the left you would see the entire crew standing there in the green Georgia woods. But I was super proud of how all that stuff looked. I think the performances in the episode are fantastic, I love Daryl and Carol, I love Negan and Judith, Michonne. There’s so much good stuff in the episode, and then to be able to play it within the backdrop of this crazy frozen snow storm, that gives us a whole new set of challenges that we’ve never seen them have to overcome before. It was a challenge for sure. What about filming the scene where Daryl gets into a snowball fight with RJ, and then Carol Michonne, and others join in? That must have been pretty surreal and fun to film that in Georgia. When we were shooting, there was originally two other scenes that we wanted to shoot, that gave us a bigger scale of Alexandria blanketed with snow. And we were going to see where Carol lives, and we were going to see where Daryl lives, and the dog was going to be running around, and Lydia was going to be playing in the snow with RJ and Judith. But the reality is, we couldn’t cover that much of Alexandria with all the fake snow because it would have taken way too long. So we created this little wedge, and I felt like we missed that moment. That moment of them playing in the snow. So, the last take I had kind of said to the guys, “Listen, just have a little bit of fun. And run over here and start making snow angels, and playing in the snow.” I filmed it and I thought, I don’t know if it’s going to work, I don’t know if it’s going to feel like it takes us out of the episode or not. But we shot it. And when I was cutting it together, I was like, I don’t know if Angela is going to love it or not, because it’s not what we had scripted, but we couldn’t shoot what was in the script for that scene. I just gave her something and she was like, “No, it’s great, I love it.” And she put it all in. I just wanted the episode to end their journey to end on a high note, a sweet note. When I look at it, I see Norman throwing snowballs. It’s kind of funny, because I know we were just sort of ad-libbing it, and I just let the cameras’ roll. But we caught a really nice moment. I guess the irony of all of this is that you guys have had some brutally cold finale shoots down there over the years in Georgia because when you get into November, it can get very cold. Now you’re finally shooting the snow, but I heard it was actually pretty warm when you guys were shooting this? Yeah, it was. The last day of shooting it was probably the coldest day. But, yeah, it was a little crazy — the times when you really want it to be cold, it’s warm and vice versa. And the trick is you set fake snow up someplace and the snow is a combination of soap suds, in front of big weather fans, and then sometimes it was like paper. And it was all this different stuff, but the minute it rains, your snow is dead. So, we were constantly terrified that we would dress a set, and then it was going to start to rain. And it did on one or two occasions, and we had to go back and re-dress some of the snow. Are you sad to say goodbye to the Kingdom? Hell no! [Laughs] I love shooting up there. I introduced the Kingdom when it first popped up a couple of seasons ago. And it’s always fun to have new locations to shoot, but you can’t stay in one location for too long. When the show works is when it’s nomadic. And I think that’s one of the great things about this episode is that it definitely feels like classic Walking Dead, because it’s the people found in the world, having to fend for themselves, as opposed to having this safe haven that they can go to. I always try and look for your Easter eggs, and we have a scene at the end of Alpha and Beta and as you pan over we see all these zombie skin masks hanging up and I have to say, they bore quite a resemblance to a certain Necronomicon from Evil Dead. That was a little more of a subtle nod. I had a couple of Evil Dead Easter eggs this season. We had the Necronomican in episode 5. The cabin that Rick goes into was designed after the cabin from Evil Dead. There was also one traveling shot here, where we see a half zombie laying on the ground, and then we tilt up and see everybody walking? That was a tribute to Return of the Living Dead and the half corpse on the table. Also check out Walking Dead showrunner Angela Kang answering our season finale burning questions. And for more TWD scoop, follow Dalton on Twitter @DaltonRoss.